The beaver is the largest rodent in the world. You probably think of mice and rats as rodents, well beavers are also included in the rodent family. Beavers live in colonies (like a family) with the other beavers. They build dams to protect themselves from predators. Beavers are known for building Dams out of trees and braches within in rv ers / streams, in return creating ponds which are filled with deep and still water. They build dams by using logs and branches and then filling in the spaces with mud and weeds. Beavers are able to do this because they have teeth that never get worn down and feet that are webbed. They are quite unique creatures. 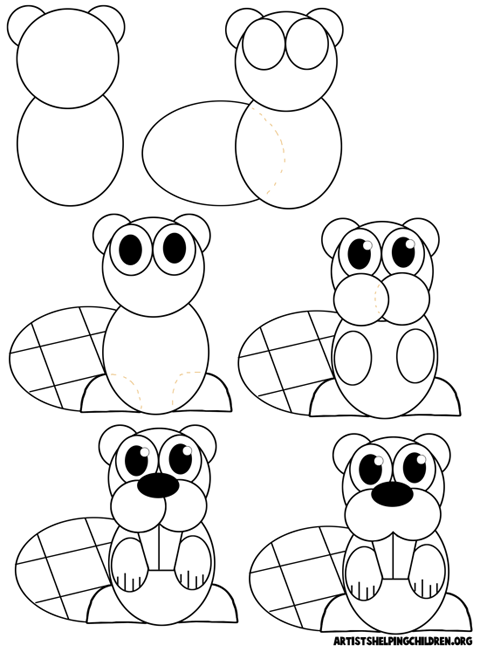 In order to make beaver crafts, it will be helpful for you to learn how to draw them. 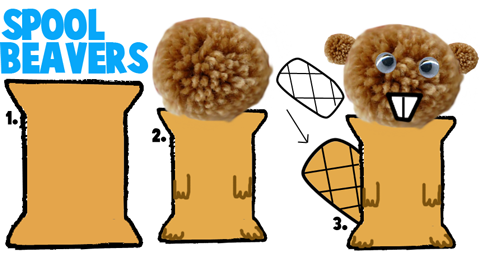 I have put together a basic drawing lesson for kids to learn how to draw cartoon beavers. It is below. If you want ... Skip to the beaver crafts. Start off drawing cartoon beavers by drawing 2 circles in the shape of a number '8'. Draw a half circle for each ear. Then draw an oval for each eye and an oval for the tail. Draw a letter 'D' for each foot. Draw a tic-tac-toe board on the tail. Draw a black oval inside the beaver's eyes. Draw a white circle for the highlight in the eye. Draw an oval for each hand. Draw 2 circles for the snout. Draw a boxey letter 'W' for the teeth. Draw lines in the hands. Erase the guidelines and mistakes to make the cartoon beaver. You can make beaver crafts with some simple ideas such as using a cardboard toilet paper roll tube for the body. This will stand on its own. Then Use the beaver drawing tutorial above to draw a beaver on brown paper. Use white paper for the eyes and the teeth. Black paper for the inside of the eyes and the nose. Glue it on the tube. Cut out a brown oval for each hand. For the beaver's tail...cut out a large brown or orange oval and attach it to the back of the cardboard tube. This turns out adorable and it stands on its own. Take 2 large brown pom poms for the base of the body and the head....glue them together. use white foam for the teeth and googly eyes for the eyes. Cut out a brown or orange oval foam for the tail....and brown circles for the airs. Then attach a magnet or a pin clasp to the back of it to make a refridgerator magnet or a jewelry pin. These will turn out to look so cute. You will need an empty thread spool, paint and brush, brown pom-poms, googly eyes, paper, and a black markers. First of all, if you're spool isn't already tan or brown, paint it that color. Let it dry and then paint letter 'W' shaped paws (the 'W' should have an extra hump). Glue a large brown pom-pom on top of the thread spool, as seen in picture #2. Glue pom-pom eyes on the pom-pom head. If you have small brown pom-poms, glue them on the head for ears. Otherwise, cut out brown paper circles and glue them on for ears. Cut out big teeth and glue them on the face as well...the bigger they are, the goofier the beaver will look. 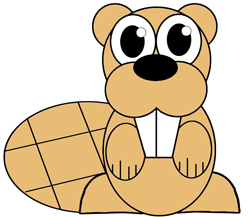 For the beaver's tail, cut out a rounded rectangle on a brown piece of paper...with diagonal lines on them. Glue this onto the back of the beaver. And that's it ...I hope your beaver turned out great. 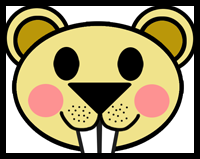 To make a paper beaver mask, print out the following beaver mask template and follow the included instructions. How to Draw Cartoon Beavers - The following step by step drawing lessons will guide you through the steps of cartooning beavers.